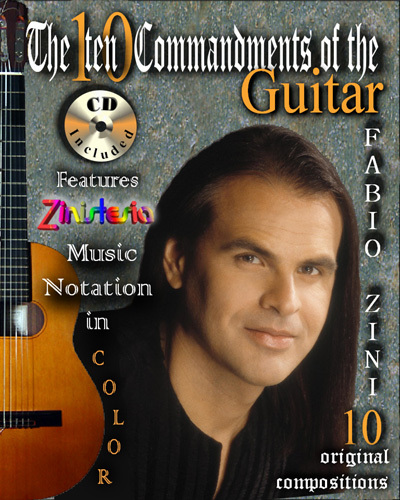 Features Zinistesia, The first Music Notation in Color for classical guitar, unique method of teaching, writing and reading music in COLOR. All original compositions by Fabio Zini. All performances on the enclosed CD are by the composer. 1. Prelude No. 1 "The Journey"
"The Ten Commandments of the Guitar" features 10 original compositions written in the Zinistesia System. Written musical scores have always been written using musical signs printed in black and white. This has led to frustration and confusion when it comes to reading music because of the alternation that occurs when looking at the instrument and what is written, i.e. the score. The Zinistesia System avoids the difficulty that students and musicians have in analyzing the score. The Zinistesia System clarifies and explains the organization of the score, allowing for a more effective rendition of the performance. Zinistesia is a revolutionary system which uses multicolor coding to indicate specific components of the musical work. In Zinistesia, a student or musician can easily identify each component of the musical score, such as the melody or theme, transition or bridge, accompaniment, counter-song, coda etc., because they are denoted by separate colors. Using this color-coded system, the student or musical performer will instantly know which component of the musical score is being played. In addition, Zinistesia accelerates the learning process and allows the student or musician, to focus on the elements of the musical language. The color coding fosters a higher level of concentration thus allowing the performer to memorize more extensive and complex pieces in a more efficient manner. Undoubtedly this innovative Zinistesia System, created by composer and guitarist Fabio Zini, provides a new dimension in the teaching, reading, writing and performance of a musical score. "BLACK AND WHITE IS BORING - C O L O R S ENLIGHTEN YOUR PLAYING"